Add 1/4 cup of olive oil to a large pan over low heat. Mince 6 garlic cloves, and put them in the oil. They should cook slowly to release their flavor, so don’t let them brown. 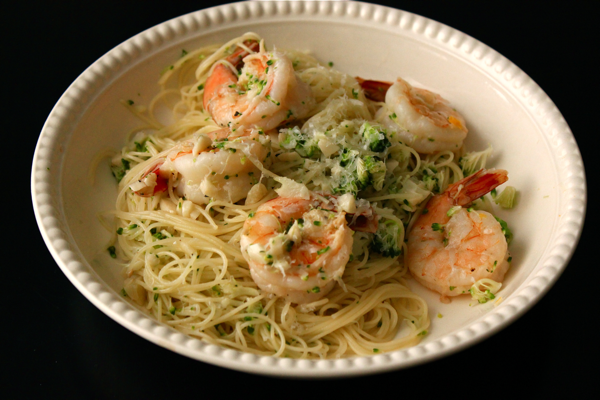 While the garlic infuses, boil 1/2 pound of pasta in salted water until it is cooked al dente. When the pasta is done, strain it and set it aside. 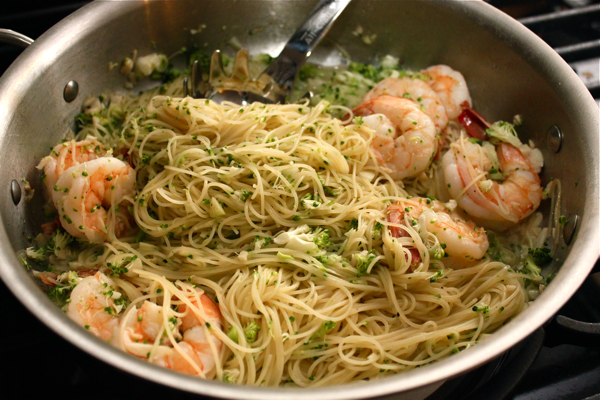 After the garlic has softened, add 3/4 cup of white wine to the pan, and let it simmer slowly. Let the liquid reduce by about half, and then add in jumbo shrimp to cook until they are pink and opaque. Shave the very tops off of some broccoli and add the green bits to the pan. The broccoli adds some nice color and a slightly crunchy texture, but you could skip it an add in some freshly chopped parsley before serving instead. Squeeze the juice from 1 lemon into the pan, and then season the liquid with salt and pepper. Add the pasta to the pan, and stir it around to let it absorb the liquid. 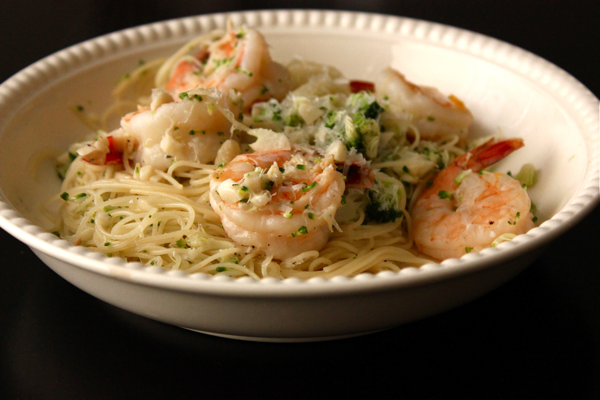 Transfer the pasta and shrimp into bowls, and grate over a generous amount of parmesan cheese. Taste the sauce as you go so you can adjust the ratios of the ingredients until you get a flavor you love.